All art is a reply to previous art—sometimes a rebuttal. For example, Impressionism was a reaction against Neo-Classical art, with its photographic images of generals and society ladies. But Neoclassicism was itself a revolt against the wedding-cake-ornateness of Baroque art. 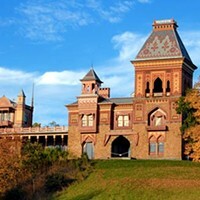 Olana, the historic home of Hudson River School artist Frederic Church, has asked MacArthur Award-winning artist Teresita Fernández to curate a show in their galleries—to "reply" to Church's art. The result, "Overlook: Teresita Fernández Confronts Frederic Church at Olana," will remain on view until November 5. Before photography was readily reproducible, oil paintings were one way to see the world. Church was a one-man National Geographic, visiting remote regions. He painted icebergs in the Arctic, the jungles of Columbia, Jerusalem from the Mount of Olives and reported back with large canvases. The Heart of the Andes, Church's most famous painting, is an idealized landscape of Ecuador, combining mountains, jungles, grasslands, and a waterfall—plus two peasants kneeling before a Christian altar. Church exhibited the work in a New York City auditorium, with enhanced lighting and dramatic curtains. The cost of admission was 25 cents, and more than 12,000 viewers paid to see it. Frederic Church became the most famous painter in America. 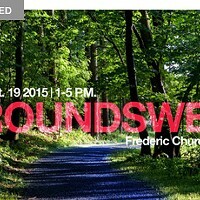 Chronogram Presents... 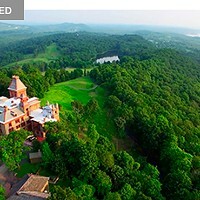 OVERLOOK at OLANA: Teresita Fernandez curates Frederic Church from Luminary Media on Vimeo. Church saw South America as an innocent place of unspoiled beauty, an extension of the wild expanses of the Hudson Valley—but he ignored the legacy of colonialism. "Overlook" is a collaboration with the Colección Patricia Phelps de Cisneros, a collection begun by a Venezuelan couple. (It recently donated over 100 items to MoMA.) The focus is on Latin American art, including the "Traveler Series," made by artists visiting the region, one of whom was Church. Fernández chose pieces from the Cisneros collection, as well as from Olana's own trove of paintings, and strategically inserted her own works into the show. Fernández is also a sculptor, working in numerous mediums: silk thread, glass beads, acrylic tiles, plastic tubes, and marble dust. Born to Cuban parents in Miami, she now lives in Brooklyn. "Fernández's work engages with the ideas of landscape and its history on a North-South axis," explains Gabriel Pérez-Barreiro, director of the Cisneros collection. On the first floor of Church's house, five large-scale South American landscapes hang, including the Italian artist Alessandro Ciccarelli's supremely harmonious View of Rio De Janeiro (c. 1840). Six paintings by Church from Olana's holdings are on view. The Sharp Gallery on Olana's second floor is divided into three sections: landscape, portraits, and botanical works. All three are hung salon style. The portraits and floral drawings are by Auguste Morisot, a French artist who traveled with the explorer Jean Chaffanjan on Venezuela's Orinoco River in 1886. Morisot made clear-eyed sketches of sailors, servants, Indians, and other Venezuelans the expedition party encountered. A smaller room displays his jubilant renderings of flowering datura, lilac, orchids—and mysterious blooms without notation. Fernández has created several new pieces in her Nocturnal series for this show, which consist of mined graphite mounted on wooden panels. Here the artist examines graphite—the fundamental source of all pencil drawing—in its primordial state, before it's been industrially milled and transformed into narrow cylinders. Graphite itself is art, Fernández suggests. There's no need to draw with it; just look at its original, darkly reflective, form. It's a bit like looking into the face of God. The graphite relief sculptures she makes, with their horizontal striations, resemble landscapes. Fernández often works with mined materials—including gold—because she's fascinated by phenomena that are completely natural, formally abstract, and artificial in appearance. Graphite is inside every pencil, yet its newly mined state is as bizarre as moon rocks. Fernández's installations may be seen as psychological experiments, studying how viewers respond to the unexpected. Does her "intervention" in Church's mansion succeed? The only way to decide for sure is to visit Olana. "Overlook: Teresita Fernández Confronts Frederic Church at Olana" will remain at Olana, in Hudson, until November 5. (518) 828-0135.